Custom Golf Gift Boxes Personalized in Bulk. Promotional, Inexpensive. 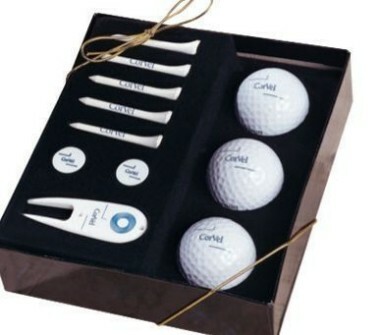 Our bulk personalized gift boxes display a complement of high quality, printed golf elements. We can imprint your logo on all the items of the bulk golf gift box, including the box itself, but there are separate setup charges for each type of item: see the Price Table. Free artwork design . Budget Prices in USA and Canada for bulk personalized golf gift boxes . American clients pay no taxes. The basic unit price includes 1-color imprint on all items. However you need to pay Setup Charges of $29.00 for each type of item that you want to imprint. The Setup Charge for imprint on the box is $59.00. You may choose to only imprint some items. Setup Charge: $29.00 per type of item. The Setup Charge is $116.00 if you want imprint on all 4 items: balls, tees, markers, divot tool. Production Time: 7 days afterart approval. Add 15% for 3-day production. All printed with your logo or art. Packaging: Gift Box, as shown.